Yesterday we enjoyed seeing the neck tattoo of a Missouri-based artist nicknamed "Dirtbird," as well as a piece he had inked on his friend Shawn. Katie explained that this is a wedding tattoo. The piece depicts a heart, comprised of a male and female bird, sewn together. Since she married Dirtbird, this seems like and appropriate expression of their matrimony. The tattoo was inked by Becky "Pink Eye" Ashcraft, who works with Dirtbird at Punkteur Tattoo in Joplin, Missouri. 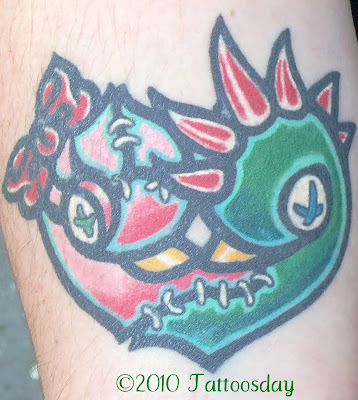 Thanks to Katie for sharing her cool tattoo with us here on Tattoosday!